Books2Go is a free outreach service for hundreds of children in local elementary classrooms and Head Start Centers. This program models best read-aloud practices for both students and teachers, helping children to develop important language development and comprehension skills. Books2Go fosters a love of reading, and provides low-income children with free books to develop a collection of their own, creating a joyful learning experience. Additionally, Books2Go provides students and teachers with opportunities to extend learning through activities designed to complement the Voluntary State Curriculum. For more information, contact Annie Malone, Lead Teacher, at 410-235-2210, ext. 208. 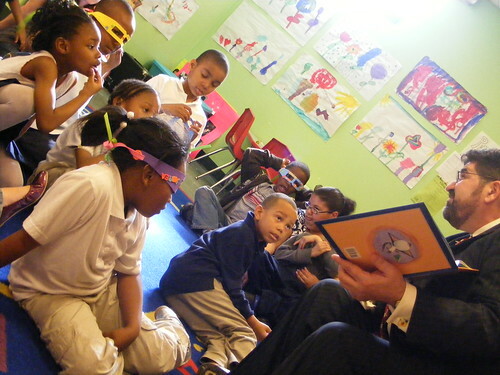 Former Baltimore City Schools CEO Dr. Andres Alonso reads to Margaret Brent kindergartners at the VLP during National Library Week 2009.